I’m running through all three Topper films, so today’s repost looks at my original review. It’s easy to confuse today’s film with several others that deal with lovable spirits trying to make amends. When I sat down to watch Topper, and well into the film’s runtime, I compared it to the 1978 remake of Heaven Can Wait. Regardless of the comparisons I enjoyed Topper from beginning to end. Topper effortlessly mixes screwball comedy with a heartfelt message about living life to the fullest and boasts hilarious performances from Cary Grant, Constance Bennett, and Roland Young. So far, this is the ghost story I recommend seeking out and giving a shot. Marion and George Kerby (Bennett and Grant respectively) are wealthy thrill seekers with little interest in responsibility. When they crash their new car, they’re stuck on Earth until they can perform a good deed. They decide to help the stuck-up Cosmo Topper (Young) whose life is scheduled down to the second by his wife Clara (Billie Burke). Topper is an interesting film in Cary Grant lore because it was Grant’s first turn at screwball comedy! Yes, after this not only would Grant not take a supporting role but he became the king of the screwball. In comparison to Bennett and Young, Grant appears to have the least amount of screen time throughout the film’s 97 minute time-frame. The entire third act is devoid of Grant causing me to ask “where did he go?” I don’t recall anyone mentioning where George/Grant is, Marion simply says he’s “drifted away.” Around the hour and twenty mark George returns, but he is definitely relegated to the background. The true core of Topper is our title character, played by Young, and how he discovers a life worth living with the help of Marion. The reckless Kerby’s are who we’re introduced to first, and while you assume after their demise that the story would be presented through their eyes, aiming to find the good deed that will get them into Heaven, it isn’t. We learn all we need to know about them in the opening moments; in the first scene to be precise as George steers the car with his knees. The film establishes the Kerby’s as partying their way through life, indifferent to each other despite their love; Marion is having a conversation with herself as George sings. While I loved the film that director Norman Z. McLeod gave me, I yearned to see how death affected the Kerby’s. When they die they’re just surprised that they aren’t in Heaven. George asks “What do you suppose is the conventional thing to do now” (LOVE that line). They’re not crying about being killed so young, they’re not pondering on regrets. In fact death is as bland to them as everything else in life. When Marion vows to help Topper it’s more a wacky game as opposed to a serious way for them to move on to the afterlife. I’m sure this route was taken to distance Topper from other films about dead people but I was taken aback by how “meh” to the whole thing the Kerby’s were. The Kerby’s are representative of the typical rich seen in countless screwball comedies. They’re extravagant, unable to see that people are laughing at them and not with them, are disrespectful to authority (I love the way Marion turns to George and says it’s a “C-O-P” as the cop stands next to them), and driving while drunk is the national pastime. However, they’re no different from anyone else in the fact that they can be killed and the town soon forgets about them. Grant and Bennett, as actors, are amazing here. They know each other’s moves and are able to respond at the drop of a hat to any situation making it a mark of solid acting but cementing their relationship as one where they can predict how the other will react. Grant plays the devil-may-care character with aplomb and I was never let down. He shows the future comedic timing that would make him such an enduring icon. His entrance to a board meeting in the opening presents George as a child, proud of the fact that “I made it” as he throws his legs over the chair to sit down. The true scene stealer is the gorgeous Constance Bennett, who I’m hoping will get into my Hall of Fame in the future. I’ve seen Bennett in As Young as You Feel, which I covered during My Month with Marilyn, but I don’t remember much about her, or the film, so I’m not counting it towards her Hall of Fame potential. As a standalone performance I adored her, by far. She’s gorgeous to be sure, evoking a Myrna Loy quality with her exotic looks in contrast to her blonde hair. She’s wacky but highly flirtatious, especially with the old Topper. Marion also has the same child-like quality Grant has. She feels she can “take Mr. Topper apart and put him back together,” like a small child dissecting a favorite toy to make it how they’d prefer. Topper himself doesn’t help as he thinks Marion is an angel, establishing this notion that he’s a father idealizing his child. The fulcrum around which the plot runs is on Topper himself (the film is named after him) as he discovers his freedom. His life is regimented down to the last second and sweetly controlled by his wife Clara. Topper, however, dreams of spontaneity; “What if I want to eat something different” when he sees the same food for breakfast; he’s not even allowed to run fast. The theme I’ve gotten whilst watching and reviewing this is all the characters are infantilized, whether by their position in life (the Kerby’s wealth), or the fear of being different (Clara worries about what the neighbors will say). To me, the group are infantilized due to complacency. They don’t have to worry about money or “middle class problems.” All they have to do is be reckless and find a new grand adventure. In this case it’s the ultimate adventure of death. To Topper especially, Clara isn’t maliciously controlling him. I find she fears him dying in many ways and fears the unknown, a life without him shatters her complacency. Topper, himself, wants to value life (something the Kerby’s didn’t) and live, and the Kerby’s make him fairly miserable in the process. His main goal is purely to do things he’s not allowed, like smoke or dance, and he doesn’t care about failing at them he simply wants to experience them. Topper becomes the definition of moderation! According to IMDB, I’ve seen Young in two other movies besides this (one being The Philadelphia Story opposite Grant) and yet I can’t recall him in that. Young is meek and blustery, the perfect foil to the capricious Kerby’s. He never lets anything frazzle him, maintaining his decorum throughout the wackiest of situations. Playing opposite Young is the darling Billie Burke as his wife, Clara. Who doesn’t love her? Along with Bennett I crave a movie with her simply being adorable for 90 minutes. As I mentioned she’s just as indifferent about her life as the Kerby’s, although where they don’t care whether they live or die, Clara Topper is deathly afraid of being shunned from proper society. When it’s alluded to in the papers that Topper is stepping out on Clara, she freaks out and declares this couldn’t have happened at a worse time because it will prevent them from being invited to a party. Billie Burke elevates flustering while crying to new highs. The film heads full-circle into dark territory when Topper “dies” the same way the Kerby’s did. He is knocked unconscious and actually has a heart-felt debate on whether he should live or die. With the Kerby’s he has no worries at all, but he wouldn’t be appreciating life. He discovers his wife truly loves him, and unlike the Kerby’s he couldn’t be with her. The ending of the film truly makes you appreciate life and death without getting melodramatic or preachy. Topper is such a sweet movie and I highly recommend it. I’m not sure yet on whether I’ll watch the two Topper sequels, as I’m sure they’re nowhere near as amazing as this one but I might seek them out. There’s definitely a Charles-esque sensibility. 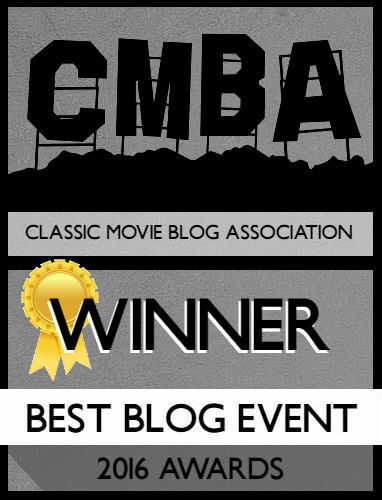 I even compared Constance Bennett to Myrna Loy and any movie that “borrows” from The Thin Man works in my book. Oh I saw this film years ago – about time for a rewatch I think! Very enjoyable film 🙂 I haven’t gotten hold of any of the sequels either. Wonder how those compare. According to Amazon the only sequel available is the last one (Topper Returns). The two “Topper” movies above were adapted from novels written by Thorne Smith, a master of ribald fantasy in the 1920s; some of the elements of his books had to be toned down to reach the screen in post-Code Hollywood. 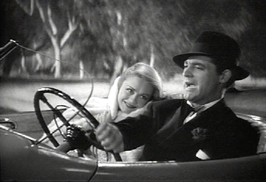 Both “Topper” and “Topper Takes A Trip” (which stars Bennett and Young, but not Grant, though it does have the dog from the “Thin Man” movies as “ghost dog” Mr. Atlas) will be on TCM in November, as Constance Bennett will be its Star of the Month each Tuesday. Connie was a big star, particularly in the early 1930s, when she was a pre-Code queen renowned for glamour and sophistication. If you want to learn more about Bennett, you’ll have your chance this fall. One of the great things about “Topper” is the seamless special effects work from Hal Roach’s Roy Seawright (the film was released via MGM, which distributed Roach’s two-reelers and other product). In 1938, the Los Angeles Times provided a behind-the-scenes look at how Connie’s “ectoplasm” was made to appear and disappear. Learn about it at http://carole-and-co.livejournal.com/160350.html (part of my site, http://carole-and-co.livejournal.com, which I’ve operated for more than five years and 2,000 entries). You have a fine site, BTW. I’m looking forward to exploring more of it. I know where I’ll be in November. The second Topper is hard to find, it’s not available on DVD although the third one (with Joan Blondell appears to be in public domain as its everywhere) is so I’ll be excited to finish out the series and find out how much I like Ms. Bennett. I did love the effects work in the film, thanks for the info and Carole and Co is going on my favorites list for sure! 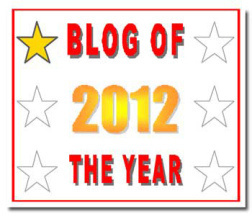 Thanks for the compliments on the site and for giving me a new blog to check out! Just to clarify things, “Topper” and “Topper Takes A Trip” were written by Thorne Smith. 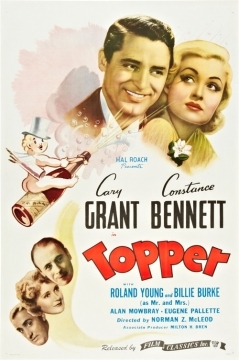 “Topper Returns,” the last in the series, was an original story and features Joan Blondell as a ghost, not Constance Bennett. “Topper” was also revived as a 1950s TV series with Robert Sterling and Anne Jeffreys as the Kerbys and Leo G. Carroll as Topper; there was also a 1979 TV movie where Kate Jackson played Marion Kerby. It’s always surprising to me how throughout the 60s-70s the films that were mined for television show. This is one of my favorite Cary Grant films (which says a lot because I love almost all of his films)! I just watched it last month but this makes me want to watch it again. 🙂 Nice review! Grant is one actor where you can never have enough “favorite films” with him!